Do We Need Them After All? 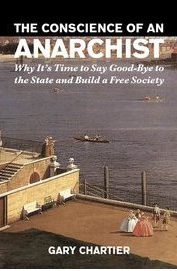 That’s what’s so interesting about Gary Chartier’s 2011 book The Conscience of an Anarchist. Chartier has heard it all before: government has an important role to play, but beyond that role it is parasitic, incompetent, prone to corruption, etc. We just need to get back to the Founding Fathers, or the original Constitution, or whatever. Now no doubt the vision of the Founding Fathers and the original Constitution would be a vast improvement over what we have now, which is why many people of Chartier’s persuasion support any move in that healthy direction. But they wonder if we may in fact be conceding too much. Chartier believes in private property, so he isn’t of the brand of anarchism that despises the state for protecting private property. Chartier’s point is that the state aggresses against private property. But he goes much farther than this, paying particular attention to how the state disproportionately benefits the wealthy and powerful, and is often the source of such people’s wealth and power. He catalogues the ways the state harms the average person and keeps him from rising above his modest condition. And he shows how even the most intractable problems can be solved via voluntary human relations. It’s a short book, but one packed with insights that will get you thinking. Chartier has pledged to donate all proceeds to Antiwar.com. Check it out!